The globe is criss-crossed with borders and boundaries, designating countries and states each with its own culture, identity and regulations. However, these geopolitical borders were created by humans for humans and animals follow their own geography, wonderfully oblivious to the way we have divided up their world. Animals often require different habitats and environmental conditions for mating, breeding and feeding and so migrate between areas in order to find the resources they need. Some migration routes are relatively short, perhaps just between one side of a mountain range to another, but some species will travel for thousands of miles. A wide range of animal groups make such mammoth migrations; including birds, mammals, fish, invertebrates and reptiles. Species which make these epic journeys have adapted to time their movements in response to external and internal cues. External cues include a range of environmental signals; including day length, local climate and availability of food. While internal cues may include body condition or the bodies internal, circadian, rhythms. Once they are underway, animals may navigate with the aid of the sun, stars, magnetic fields, winds, currents and even smell, however, the exact mechanisms remain unknown in many animals. Whether by instinct or learned group experience individuals can follow the same routes and return to ancestral breeding and feeding grounds year on year. The great shearwater is one of the smaller seabirds that breed only in the Tristan archipelago and nowhere else in the world. They may be much smaller than the albatrosses that breed alongside them on Nightingale, Gough and Inaccessible Island but they are no less of an ocean wanderer. Great shearwaters carry out a vast annual migration and circumnavigate the whole North and South Atlantic oceans. Upon leaving their breeding burrows within the Tristan Islands they will migrate West towards the Patagonian shelf edge where they will gorge on the abundant small fish and squid species that are found in the rich waters. Once they have accumulated enough fat which acts as fuel for them they will embark on a Northwards journey that will see them round the South American continent off the coast of Brazil, Northwards to the Eastern seaboard of the USA reaching the banks of New England and Atlantic Canada where they feed on the abundance of small fish such as Capelin. Once they have fattened up again on the abundant food in the Northern Hemisphere and they need to return South to breed they will often be recorded passing Ireland, England, Spain and Portugal as they head South through the Eastern North Atlantic before heading across towards Brazil and Argentina and the Patagonian shelf edge and then once again return to Tristan da Cunha to breed. An annual migration of many thousand kilometres which is repeated each and every year. With some individuals reaching up to fifty years old the total distance that some of these birds cover in their lifetime is almost unfathomable and is indeed a true marvel of nature. Affectionately and colloquially known on Tristan as a “Molly”, which comes from the once used generic term of “Mollyhawks”, used by sailors to describe medium sized albatrosses. This species is endemic to the Tristan da Cunha Island group and breeds on Tristan, Inaccessible, Nightingale and Gough Island. Atlantic Yellow-nosed Albatrosses regularly undertake great foraging trips from the Islands North Eastwards toward the African continent and the countries of Angola and Namibia where close to shore they reach the food rich waters of the Agulhas current. They will then follow these food rich waters all the way back to the Cape of South Africa where they will then head Westwards back towards Tristan da Cunha, a journey of many thousand Kilometres. This journey can often be perilous for these albatrosses as they will regularly encounter long line fishing boats in these productive waters and they are susceptible to being caught as bycatch on the hooks used for fishing which will result in drowning whilst the lines are set. A huge amount of successful work by the BirdLife Albatross Task Force in developing mitigation measures and therefore drastically reducing the amount of birds killed at sea has made this remarkable ocean journey much safer for all our worlds’ seabirds, including the Atlantic Yellow-nosed Albatross of Tristan da Cunha. 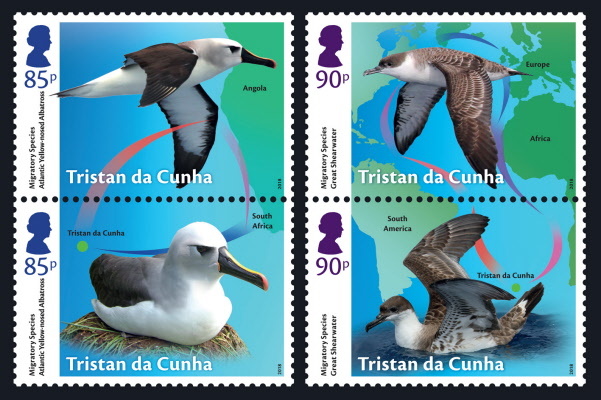 Tristan da Cunha Migratory Species is one of a complimentary suite of stamps being issued in 2018 by British Overseas Territories including Ascension Island, British Antarctic Territory, Falkland Islands and South Georgia and South Sandwich Islands.